Renowned sculptor Henry Moore’s Reclining Figure No. 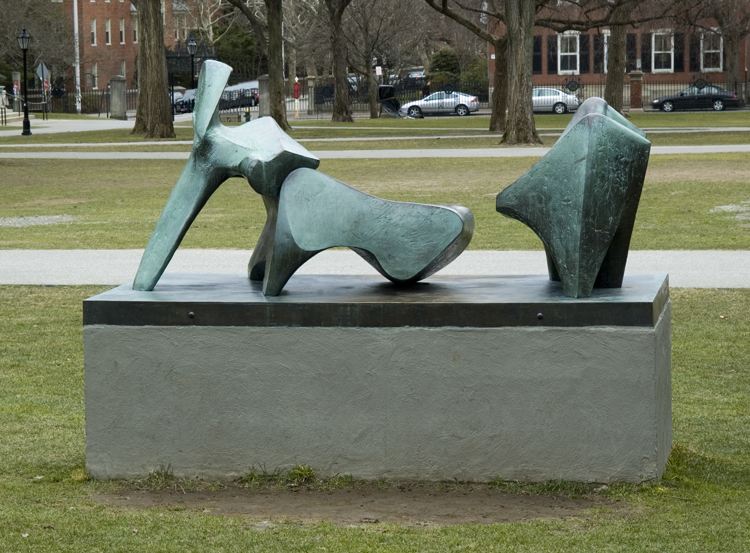 2 — Bridge Prop (also known as Three Piece Reclining Figure), installed on the Main Green, is an exploration of the body through the interconnectedness of its various bifurcated pieces. According to the artist, the work was inspired by Waterloo Bridge, London, in which he saw one part of the bridge resting against another — thus the subtitle Bridge Prop. People engage, consciously or not, with the body represented by these three shapely parts. 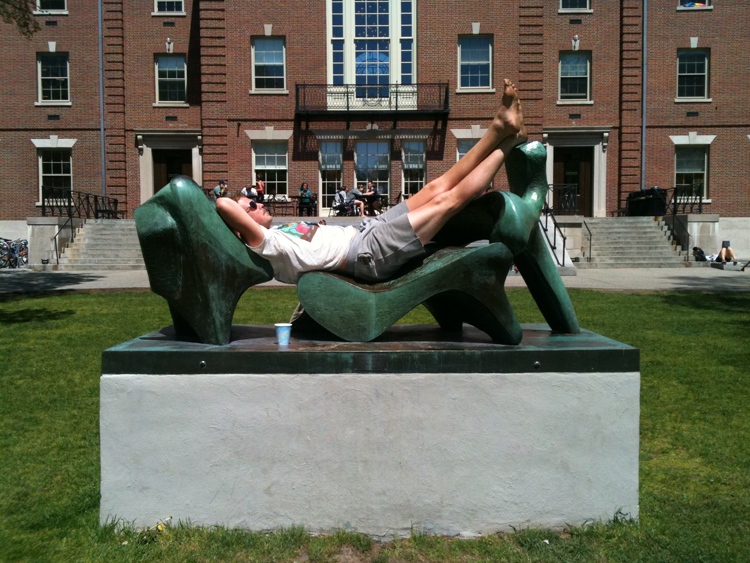 It seems fitting that this sculpture of a reclining figure lives on the Main Green, where people often come to sit, relax, and enjoy the campus. Frequently climbed upon and photographed, Bridge Prop is a fixture of the Brown landscape. This is largely in keeping with Moore’s interest in the site of his pieces which are often situated in a variety of locations. Though suitable in urban environments, Moore’s work – consisting of arches, ovals, interlocking pieces, figures, and more – seems most at home in the natural world. Unconsumed by passing trends and styles, Moore’s artistic vision was guided by his love for nature and organic forms. From personal to monumental, Moore’s sculptures come in a variety of sizes. He’s also a master of materials, working with various types of stone, wood, earthenware, and synthetics. His aesthetic sensibility and engineering expertise is reflected in the structural balance of his works, making them seem at once grounded and lively. He is widely considered to be instrumental in the exploration of modernism in the United Kingdom. While the curvature and mass of many of Moore’s sculptures echo the body, his series of reclining figures represents an extended exploration with the human form both in and as landscape. In the case of Bridge Prop and others, the body is represented in multiple pieces that seem to rise up from or disappear into the footprint. These pieces, together, constitute a body that is not fully visible but still completely present. The fun and festive ways viewers engage with Bridge Prop add another layer to the life and dynamism of the piece. Moore’s work appears in many different sites, from sculpture parks, to urban environments, to gardens, and more. Over the course of his career, he created a robust body of work, and was featured in many solo and museum exhibitions, festivals, and retrospective. He received the International Sculpture Prize at the Venice Biennale in 1948, and was also a trustee of both the National Gallery and the Tate Gallery. The donors, Mr. and Mrs. David Finn were close friends with Henry Moore and his family. David Finn photographed Bridge Prop, and collaborated with poet Donald Hall to publish a book titled As The Eye Moves…a sculpture by Henry Moore. It focuses on the sculpture itself, and the experience of the space around it.